Designed for an active sporty lifestyle, the Volkswagen Tiguan delivers excellent performance on the road or over rugged terrain. The rear seat folds 40/20/40, creating cargo possibilities galore, and the standard tow hitch prep takes an available attachment that holds four bicycles. With a 2200-pound towing capacity, the Tiguan can pull a small boat. Tiguan styling was revised for 2012, sleeker than before, while maintaining the Volkswagen family resemblance. In fact, if you look at a picture of all Volkswagens made, the noses all look the same: a smooth horizontal line of grille and headlamps, which stretches into a small smile. Each Tiguan added an electronic parking brake and a leather-wrapped multifunction steering wheel for 2013. For 2014, trim levels and options have been altered a bit. A new R-Line exterior and interior package is available, comparable to R-Line editions of the Beetle, CC and Touareg. The Fender premium audio system is now available for lower trim levels. Also new for 2014 is a six-month, no-charge trial of VW Car-Net connected services, included on the SE trim level and above. Car-Net security/convenience features o include automatic crash notification, roadside assistance, and stolen vehicle location assistance, as well as remote vehicle access and boundary/speed alerts. A vehicle health report also is part of the service. 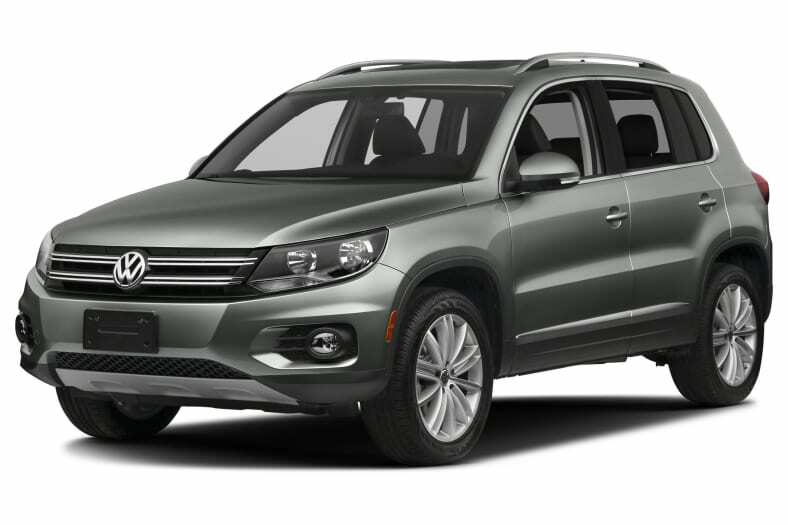 All 2014 Tiguan models use a 2.0-liter turbocharged four-cylinder engine with direct injection and variable valve timing. This engine has been around a long time and it's brilliant, now making 200 horsepower and 207 pound-feet of torque at a low 1700 rpm. Either a manual or automatic transmission may be installed, with front-wheel drive or 4Motion all-wheel drive. We found acceleration snappy and silky. The engine is smooth and silent at high speeds, where the chassis remains stable. In the Tiguan, 80 miles per hour feels like 60 mph. In fact, it's the smoothest four-cylinder we can think of. The Tiguan SE delivers a nice balance between smooth ride quality and stability at high speeds. Volkswagen says Tiguan is the GTI of compact SUVs. Fuel mileage is decent, earning an EPA-estimated 21/26 mpg City/Highway with front-drive, 20/26 with AWD. Manual shift drops the estimate to 18/26 mpg City/Highway. Economy is helped by a tall sixth-gear ratio in the 6-speed automatic transmission, and relatively low-rpm shift points. We got 22.7 mpg running the Tiguan hard on the freeway, and easy around town. The instrumentation is beautiful, and the clarity and simplicity of the touch screen and controls is outstanding. The interior materials are of a high quality, especially the V-Tex leatherette, which we couldn't tell from real leather. We recommend the optional Navigation system for its clarity and ease of use.